The MLK Weekend of Service often involves creating, but this story is about destruction. My son, Zachary and I made the trip across town to Free Geek, a community organization dedicated to refurbishing computers and getting them to students and non-profits. We arrived to find a healthy swell of volunteers waiting to get started. Right at 10 o’clock the doors opened and we crowded into the small entry way. There were 10 Hands On Volunteers, including Dannon, our enthusiastic and motivated Hands On representative, mixed amongst many others. Shortly, we were called over by Darryl, a friendly Free Geek staff member, who gave us a quick overview of our assignment. Destruction! Hundreds of computers lined the shelves. 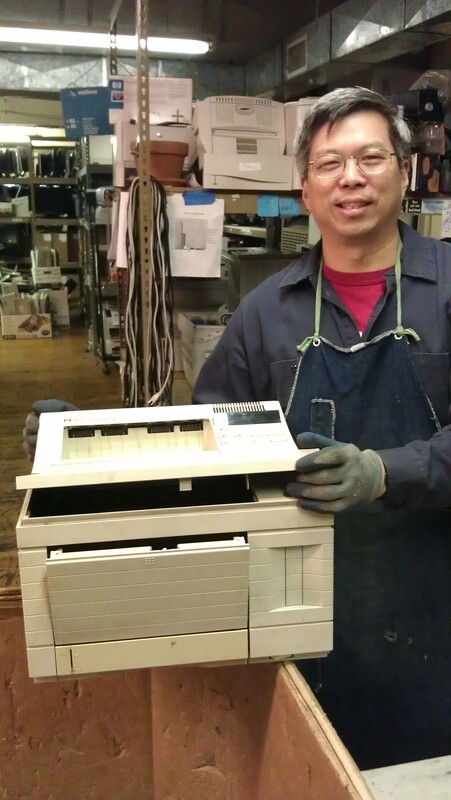 Our challenge was to disassemble printers recycling the plastic, metal, ink and most importantly, the mother boards. Mother boards contain copper, silver, and even gold. Interestingly, the high price of gold helps to fund Free Geek. Darryl told me upwards of a 1/3 of the funding for the organization comes from recycling these precious metals. Pulling apart a printer is a bit like a treasure hunt. First, you have to navigate the outer plastic shell, finding and removing any screws holding it on. Once inside, you need to dig down through layers of plastic and metal, carefully sorting each for recycling. Sometimes you find a black well of ink which gets in the way. Eventually, you find the treasure, the mother board. About an hour into our work, we were given the opportunity to see the entire operation. It was an impressive operation where volunteers were guided at every step. A very rough count told me there were at least 75 people doing everything from receiving to disassembly to building to testing. The most unique part of their effort was how Free Geek rewards it’s help. Volunteers can earn a computer by either working 24 hours in disassembly then adopting a refurbished machine, or by building 6 computers and keeping the sixth. In addition to the free computer, the volunteers get an education in computer assembly and can take classes and use the free computer lab. In 11 years, Free Geek has grown from a staff of 3 to 30, 1000 active volunteers, handling thousands of computers every year and creating an environment of learning, reuse, philanthropy and community involvement. Out of all that destruction, they’ve created something good. Free stuff, free education, free e-cycling, and free smiles. All at Free Geek! 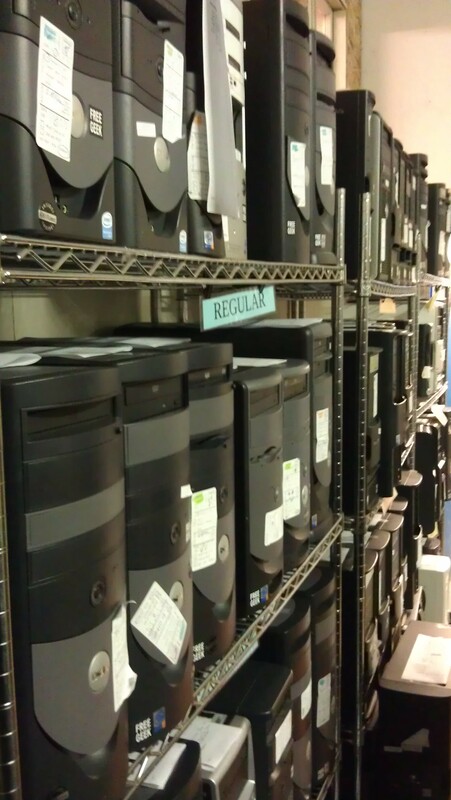 Volunteered with my son Zachary at Free Geek, a place where computers are destroyed and created anew. This entry was posted in In the community and tagged computers, e-cycling, free geek, Giving Our Time, gold, mlk weekend, postaday2012, printers, recycling, refurbishing computers, treasure hunt, Volunteering. Bookmark the permalink.